If you don’t make a Will and then die, it means that you die ‘intestate’, this means that your estate will be distributed according to the laws of intestacy and any of the following could happen. If you are not married to your partner and live together, then they will only have a right to that home if they jointly own the home with you. If they own a share as tenants in common or have simply been living with you, regardless of the length of time, then they will not be entitled to that property. The property would go to your children, parents, siblings or the state ahead of going to them, leaving them potentially homeless or at the mercy of other family members. Careful estate planning can minimise the amount of inheritance tax your family need to pay, and therefore you can ensure that your family can benefit from as much of your legacy as possible. You may not think there is much to your estate and therefore it’s not worth making a Will but if you want your estate to go to the correct people and for them to actually benefit from as much of it as possible then it is important to plan ahead with a Will. An expert can advise you on how best to divide your assets and plan your estate to keep inheritance tax to a minimum. If parents die without setting out who they would want as guardian for their children, then it goes to the courts to decide. Not only would this cause unnecessary upset for your children and family but your children may end up in the care of someone you would not have wished. Another factor to consider is if you have children living with you and a non-parent partner and you die without a Will, those children would most likely go into the care of the other surviving parent, regardless of whether they have been previously involved in their upbringing. Leaving your partner, who could well be the only other ‘parent’ your children really know without any legal rights at all. It is important to decide who you like to take care of your children and to discuss this with them in advance, as well as getting it all in writing in your Will to ensure that your wishes are followed through. This is also a good time to discuss with any potential guardian any particular wishes you have for the care of your children. 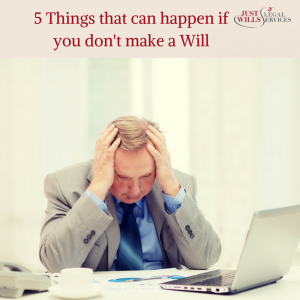 Family disputes over Wills are already on the increase but by not having a Will at all you are leaving this as an even more likely outcome. Families are left at the mercy of the law on what they inherit, regardless of what may have been said, or any impression you may have given for how you would like your estate divided. By leaving a Will making it clear who you would like to get what from your estate you can avoid any potential family upset. Due to the laws of intestacy dictating how your estate is divided it may mean that family members find themselves needing legal assistance in trying to fight their case for inheritance that should have been theirs. This sort of legal battle can be complex, lengthy and without guaranteed results there will be both a financial and emotional cost. To avoid any or all of these things happening to your family, call one of our experts now for a FREE consultation. Book online or call 01342 477 102 and quote ‘5 Things that can happen if you don’t make a Will‘.